It's Wednesday, day three of Christmas card week. My kids are out of school today. The windchill was -20 degrees. That's COLD especially this early in the season. I'm afraid of what the rest of winter is going to bring. It's been a crazy day with me trying to work and juggling six kids (my sister's kids are here too). It's nothing short of a miracle that I was able to accomplish anything today. I will admit that I did turn on a movie for them and shut my bedroom door to finish things up for today's post. Today I have another preprinted Christmas card from Tiny Prints. Today I'm working with the Joyful Chic Christmas card. This card has room for tons of photos and I used all the spots for photos. On the front of this card just above the "Merry" I wanted to add a little bit of embellishment. 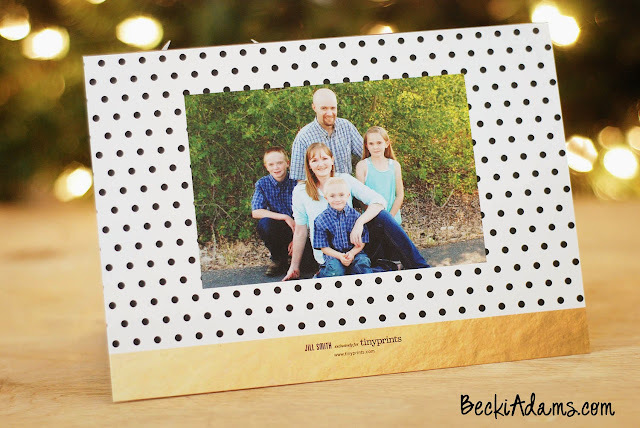 In order to have them all match I cut out embellishments using my * Silhouette Cameo and * scalloped circle punch . I use these two tools all the time when I need multiples of embellishments. I cut the deer head using * gold Pow glitter paper from American Crafts. I cannot tell you how much I love this stuff! It has all the sparkle of glitter but it does not make a mess like most glitter papers. Seriously, I had my Silhouette on my kitchen table and there was not one single flake of glitter anywhere. It's worth every penny. I need to get some more ordered for some Christmas projects. The teal paper is from the * Pebbles Home+Made collection . I've used this collection over and over. It's one of my all time favorite collections. After I had all my pieces cut out I layered them on the front of the card. I just used a little bit of adhesive on each piece. You could use * glue dots , liquid glue (I prefer * Tombow liquid adhesive ), or even * pop dots . On the inside of the card I added a strip of gold washi tape to the bottom of the card to bring a little bit of gold to the inside of the card. 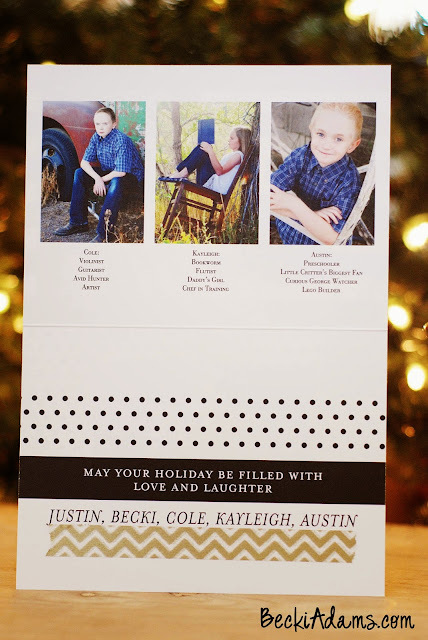 The back of the card also has a photo of our family. I'm so excited to send these cards out. I know our friends and family will love them. Tiny Prints has so many choices and the quality of the cards is amazing. I wish each of your could feel these cards. It's truly impressive! Again, because I was adding embellishments to the cards I ordered the liners so that the embellishments won't poke through the envelopes (and they're just pretty). If you missed day one and day two of Christmas card week make sure you go back and check them out. I'm sure you'll love them! 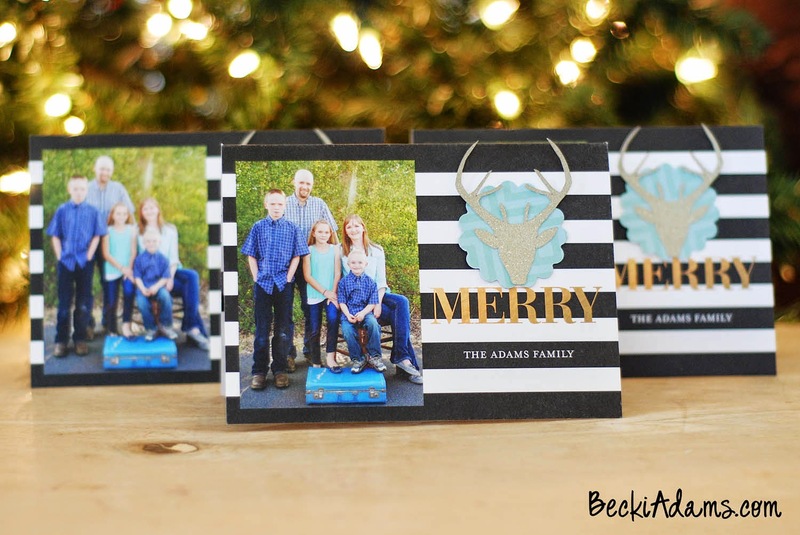 So, get started on your Christmas cards. Get them done early so you're not like me and standing in line at the drug store picking up cards that you ordered from one hour photos. Love the deer embellishment! 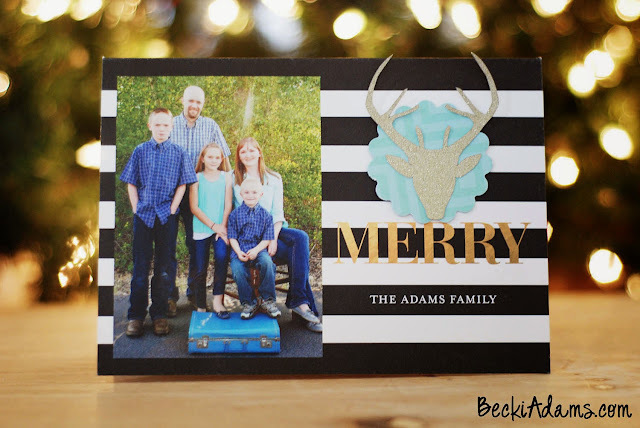 Well, love the whole card anyway but that deer head just lifts that extra notch! Well done! Thanks Sonja! I'm so glad you love the card. 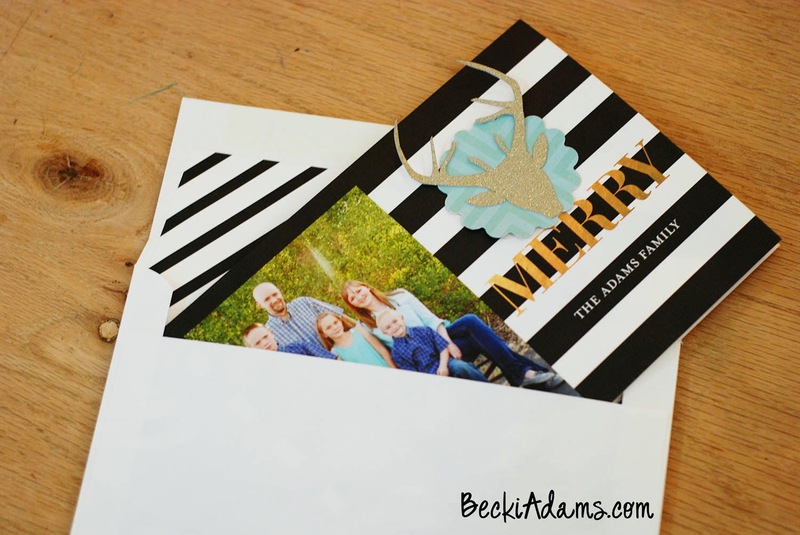 I think the deer embellishment added so much to the card too. I love how it turned out. Great job and thanks for the heads-up about American Crafts glitter paper - going to have to give it a try! !